Amish Furniture Michigan Tulip Pedestal Base Belmont Queen Ann Chairs. Amish furniture Michigan 42″ Round Tulip Pedestal Table Belmont Queen Ann Side Chair Solid Rustic Cherry, 8″ Single pedestal base. Amish Furniture Michigan Table features full 1″ thick tops, smooth opening tracks for extending the length, multiple leaf extensions available, catalyzed finish for an exceptional lifetime durability, and a plethora of style, finish colors, two tone options available, custom sizes, custom shapes, custom edge detail, and wood specie options in solid (oak, maple, cherry, rustic cherry, tiger oak (quarter sawn white oak), rustic tiger oak, tiger maple, walnut, grey elm, hickory, hard maple). Styles can be mixed and matched to make any table standard height, counter height, bar height, different pedestal styles, leg styles can be used to make the table of your design. Chairs can also be customized to your own style specifications including: 300 upholstery fabrics for seats, leather, vinyl, hand tacked leather, standard height, counter height, bar height, castors, gas lift office chair, and swivel bar stools are available in 24″ or 30″ seat height. MADE IN USA! Created by Amish craftsmen. Heirloom quality dining room your family will enjoy at every holiday meal. 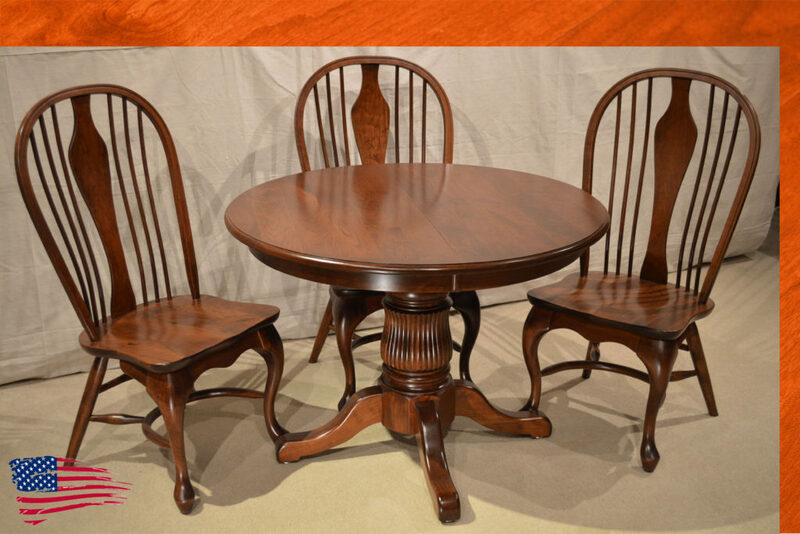 Amish Furniture Michigan Tulip Pedastal Table Queen Ann Chairs. Jasens Furniture Metro Detroit. Serving Macomb with Made in Michigan, Made in USA, solid wood furniture. Jasens Furniture Metro Detroit Roseville Michigan. Serving Macomb and South East Michigan with Made in Michigan, Made in USA, and solid wood furniture. Upholstered furniture made in USA by Flexsteel, Lancer, Best Chair, Rowe. As advertised in Detroit HOUR magazine. Specializing in solid hardwoods. Serving Detroit and Metro with the best of the best since 1951. Amish furniture stores Michigan, amish furniture stores detroit metro, amish furniture stores macomb. Jasons furniture, jasons roseville, jasens fine furniture, jasens Roseville, jasens Gratiot. Clinton township, Michigan, warren, Michigan, Mount Clemens, Michigan, Harrison Township, Michigan. Come See This Item Now!